The trip computer was an option available to most versions of the Roadster. It sat just below the stereo where the window, roof, ESP and boot buttons were originally sited. When fitted, the buttons were moved down to the lower center console with the ash tray, 12v power socket and any other storage accessories that you may have had. The small screen would provide information such as vehicle speed, RPM, temperature, journey and fuel stats. 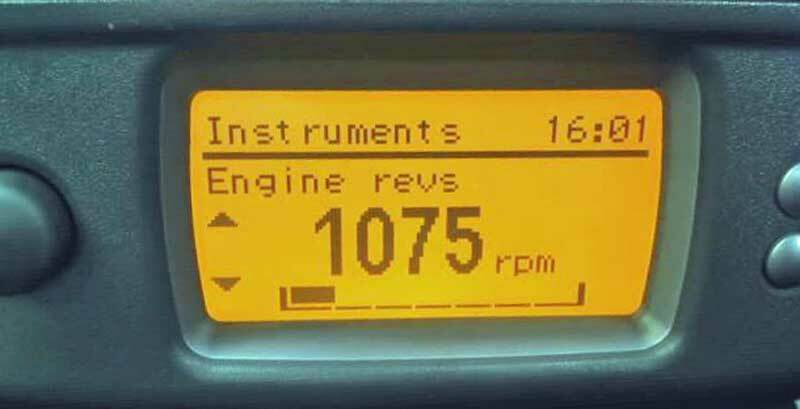 It would also show warnings such as door open, ice, engine temperature and brake fluid level amongst others. The trip computer is rare to find 2nd hand and isn't available currently from smart. The trip computer has basic controls. On the far left is a rotary controller, this is turned to select headings and parameters. This rotary controller can also be pressed to select the item that is highlighted. In the centre is the large display, this is where the data is shown. On the far right are two buttons, these are used to increase or decrease a parameter. On the first start up you are greated with some nice (basic) pictures before settling on a menu. From here you can set up or display certain parameters. To select a menu, turn the rotary control on the left to highlight a title and push the rotary control to select it. Turn the rotary control to select which parameter is viewed. Five entries can be stored in the stop watch menu.